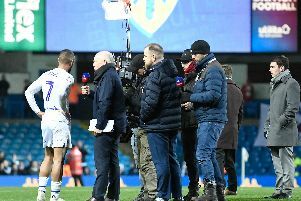 Jack Harrison's goal sent Elland Road into ecstasy - and agony for this Leeds United fan on Saturday. Even more galvanised by Millwall's late leveller at Sheffield United, The Whites knew a win would see them take another step closer to the Premier League. And achieve three points they did courtesy of Harrison's 65th-minute winner to send them three points clear in the automatic promotion race. Celebrations, as expected, were frantic, though nothing came close to the experience Whites fan Matt Richardson, 18, had. "I jumped up, ran down the steps, I missed my step and fell over," Richardson said. "Next thing I know, I look at my ankle and it’s like falling off." "I looked down and I thought: 'I probably need to go hospital' but my main priority was to carry on watching the game." With paramedics in attendance, it was recommended that he went straight to hospital. However, being the super fan that he is, Richardson wanted to see out the final 25 minutes. "I called the paramedics over but I made it clear that I was staying to watch the full 90 minutes. "I was more interested in the fact Leeds are going to the Premier League!" It is quite astonishing that he was able to crack a smile and give a good old thumbs up the camera. "I managed to crack a smile because for so many years I’ve gone to Elland Road and watched absolute rubbish. "Finally we have team with passion and desire to win, and that makes me proud to be a Leeds fan, so the passion overcame the pain." Will Richardson be more cautious when it comes to celebrating next time? "Absolutely not," he replied. 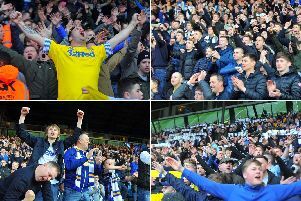 All Leeds aren't we!"